Rodney King was the first break in the dam. The beating that sparked the rebellion in 1992 was not new. What was new was video cameras. Now everybody could see the unrestrained violence against the defenseless that America calls “law enforcement.” Consumer electronics have advanced. There are cameras in every phone. Video has now recorded the recent deaths Philando Castile and Alton Sterling. It did not record the less nationally known case of Henry Green V here in Columbus. Will Smith noted on twitter last week “Racism is not increasing, it's just being recorded.” The state has noted this as well and is taking steps to stop the recording and push the daily violence against communities of color and other working communities into the shadows. Will Smith was factually incorrect in his tweet. The rate of police shooting unarmed people has actually increased since the protests against the killing of Michael Brown in Ferguson in 2014. Those protests were accompanied by a wholesale attack by the police on the press. Clearly the state is sending a message about the actual nature of so-called “rights” like the right to live or have freedom of the press. Through a combination of new laws, new technology and outright censorship, police are slowly moving to shoot and kick the truth to death and high five over it's corpse, as they did in Chicago with unarmed black teen Paul O'Neal two days ago. In response to Ferguson, noted war criminal President Barrack Obama initiated his Task Force on 21st Century Policing. This task force brought the most repressive police chiefs in America together with a few handpicked and self-appointed movement “leaders” to craft new policy mostly aimed at getting people of the streets. A key policy recommendation was body cameras, which are useful for mass surveillance and building a facial recognition database have not stemmed the tide of police violence in any way. When the Baltimore police murdered Korryn Gaines five days ago, it was in the middle of a standoff. They kicked in her door, guns literally blazing, to arrest her for an unpaid traffic fine. She held them off for a time while posting live video. Her five year old son was wounded by police gunfire. The department claims none of the officers had body cameras. It is not clear if this was true or if they were simply switched off their cameras, as they mostly did when high fiving over Paul O'Neal while he bled out. Police also claimed their cameras were not functioning while they murdered Alton Sterling. Korryn Gaines filming her own murder for traffic fines was interrupted by police. Facebook admitted yesterday that they have a law enforcement portal that allows the police to change an account setting to private, thus hiding the video. The same was done with the video of police shooting of Philando Castile, but Facebook later said “oopsss” and then allowed access to the video with a warning. Police also confiscated video from the store where Alton Sterling was shot and have harassed the bystander who filmed it. This is a tech industry assisted nation wide campaign of censorship and intimidation. Not to be outdone by Facebook, Apple has moved forward to assist police. In June, Apple patented a new device that would allow an infrared signal to be sent to iphones to stop the camera from recording. 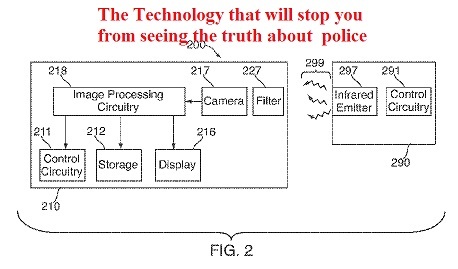 Although this patent, designed and marketed as a way to prevent the recording of live concerts, will require hardware updates in future iphones, the infrared jamming device could easily be miniaturized to fit on an officer's utility belt. Although Apple has made no announcements regarding the licensing of this technology to other phone manufacturers, the hardware modification is trivial and could be easily duplicated by other companies. It is a matter of two or three years before it will be impossible to record the police with anything but an older phone or digital camera. Taken in total, America is moving to keep it's war on itself a secret from itself. Police may now censor social media without a warrant. Police video is either not taken or not permitted to be released. Witnesses have their video seized or are harassed and arrested. Journalists are beaten and arrested for filming demonstrations against police brutality. The body cameras that were implemented for public protection are actually for total surveillance. The public's own cameras will soon cease to function at critical moments. America is in a secret war against itself and only one side is both able and permitted to watch.